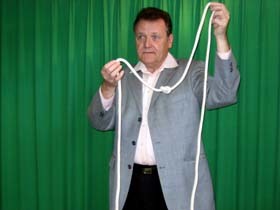 Basic Effect (NECK): Magician places a length of solid rope around his neck. He grasps the rope with both hands and give it a sharp pull. 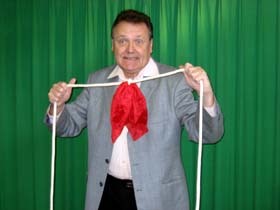 The rope is seen to penetrate visibly the magician's neck in a flash. Repeat (BODY): : A longer length of rope, passed around the magician's body penetrates his waist. Both passes (Neck and Body) can be combined. Triple Pass (with COMEDY SHORTS). 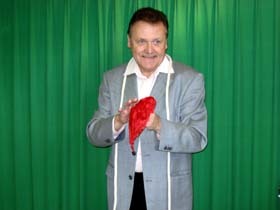 The rope, placed behind the magician's back, penetrates his body again. In addition, comedy shorts appear firmly attached in to the center of the rope. 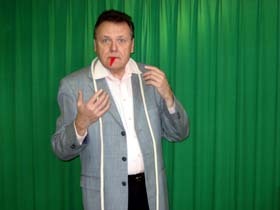 MIRACLE SILK PASS : The magician tucks a silk into his mouth and apparently swallows it. He places a length of rope around his neck. Giving it a sharp jerk, the rope is seen to pass through. Simultaneously the silk appears attached to the center of the rope.- watch - # 10 Silk Magic.